Small Mid-Century Modern burl wood desk writing hall table or console. 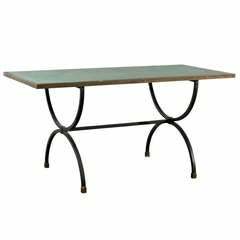 Italian console table or writing desk with slanted legs and a drawer in the middle. Mahogany wood, crystal tabletop. Made in Italy in the 1950s. Vintage mahogany burl wood sofa writing desk or console table. The piece is in excellent condition. The desk measure about 52 inches length x 24 inches width x 31 inches high.